If you're the sort that likes to linger over an iced coffee, then you know that as the ice melts, it dilutes the drink so that it starts to feel less like the drink you purchased and more like water. You might find yourself wondering why Dunkin' Donuts and Starbucks don't offer coffee ice cubes for their iced coffee drinks... but at least Dunkin' does... just not here at home. 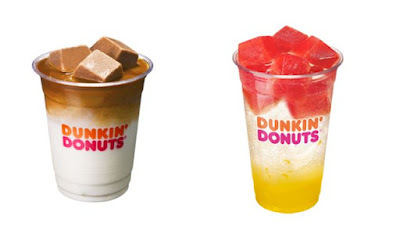 Over in South Korea, Dunkin' Donuts offers a line of "Cube Beverages" that come with coffee ice cubes as well as milk chocolate ice cubes and fruit-flavored cubes. The drinks include a caramel macchiato with coffee cubes, Red Orange Aid, and milk chocolate with milk chocolate ice cubes. Krispy Kreme also offers coffee ice cubes in South Korea with drinks like a latte with coffee ice cubes and a macchiato with milk ice cubes and a drizzle of caramel. Interestingly, the trend hasn't caught on at Starbucks in the country. As for back here in the US, none of the aforementioned brands have yet to offer coffee or flavored ice cubes but it's been on Starbucks' radar since at least 2008, when the chain claimed the lack of stores with freezer units made the idea implausible. It seems like an ice-maker could make flavored ice cubes but sanitation/cleaning might be an issue. Currently, coffee ice cubes remain an at-home solution to watered-down iced coffee but it could easily be picked up by a chain like Starbucks where offering it in small batches would fit their "handcrafted" moniker.